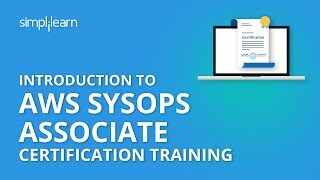 How do I become a certified AWS SysOps Associate? To become an AWS SysOps Administrator Associate, you must register for and pass the certification exam at any Kryterion testing center at over 750 locations globally. The registration fee for AWS SysOps Administrator Associate certification exam is $150. Simplilearn AWS Solution Architect Programme Course curriculum is very specific to certification. The trainers are very expert and have sound knowledge on the subject. It has the flexibility to choose between multiple batches. The online mode of training is well organized & simple to us. Customer service & LMS batch caretaker are very co-operative. I have enrolled for AWS SysOps Associate Certification Training. Training is very useful. They have robust system setup which helps for self-learning approach. I would like to recommend this training institute for my friends and employees at HP. AWS SysOps Associate was a great learning experience from Simplilearn. I completed the certification and enhanced my leadership and technical skills, which is very much rewarding in my career now. What is the question format of the AWS Certified SysOps Administrator Associate exam? The AWS Certified SysOps Administrator Associate exam is a combination of multiple-choice and multiple-answer questions.